There are restaurants, and there are food trucks, but there’s also an increasing number of teeny-tiny walk-up windows in Vancouver that keep their square footage costs minimal but the deliciousness at max levels. Here’s a list of eight food and drink focused walk-up windows in Vancouver, which provide the perfect solution when you simply want to grab-and-go. 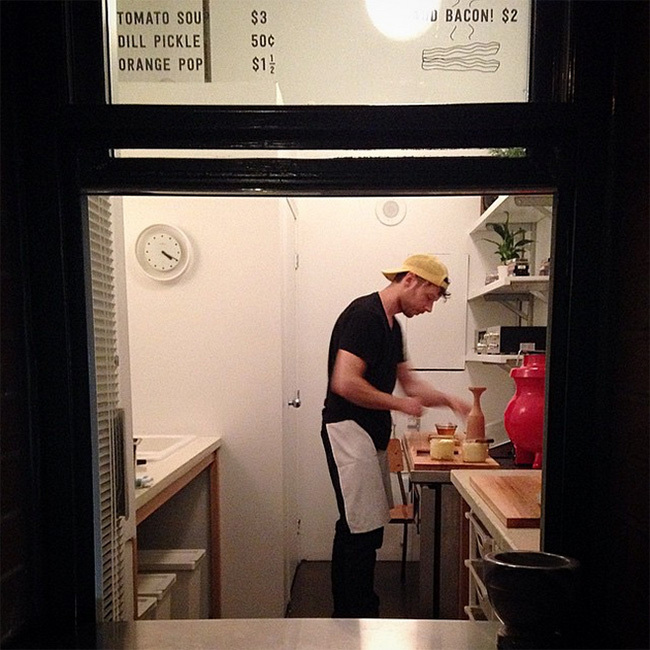 Get your grilled cheese fix at Gastown’s teeny tiny grilled cheese-only walk-up window. Toasted sammies of gooey goodness are slung together from Tuesday to Friday at lunch and then again on Friday and Saturday evenings, when the popular take away joint stays open until the early hours of the morning for all those late-night revelers. Priding itself on being the smallest commercial space in B.C. 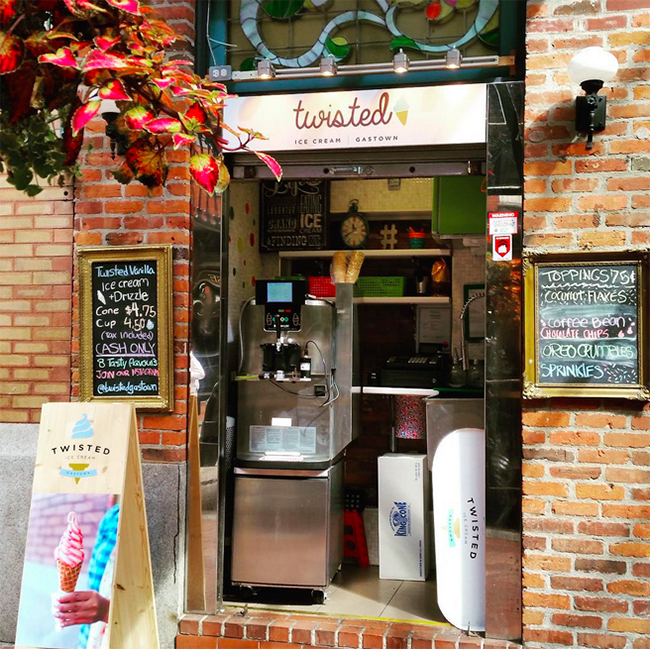 Twisted Ice Cream, in Gastown, offers passers by delightful frozen treats. Indeed, the one metre by one metre ice cream vendor serves up delicious twisted vanilla soft-serve, which can be bought either in a waffle cone or by the cup. 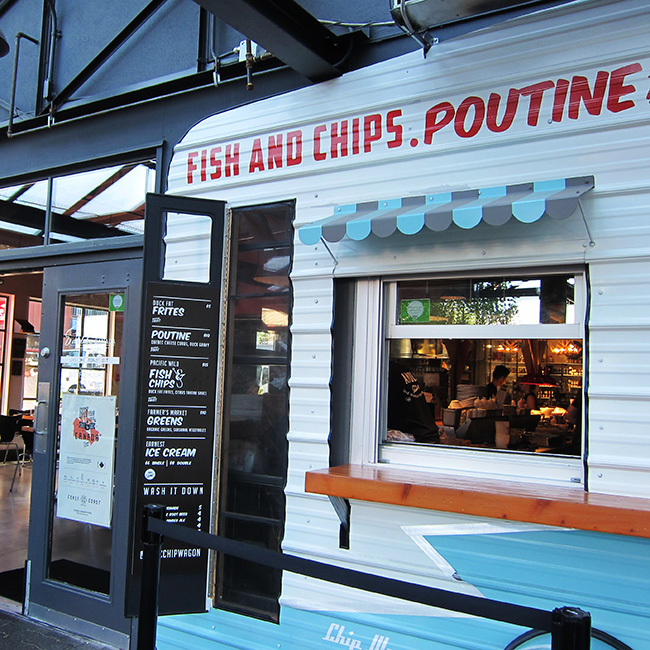 Edible Canada’s Granville Island bistro features an adorable walk-up window. Open during lunch time hours, the takeout window features a handful of tempting bites, including Duck Fat Frites, Poutine, Fish and Chips, Farmer’s Market Greens, and Earnest Ice Cream. 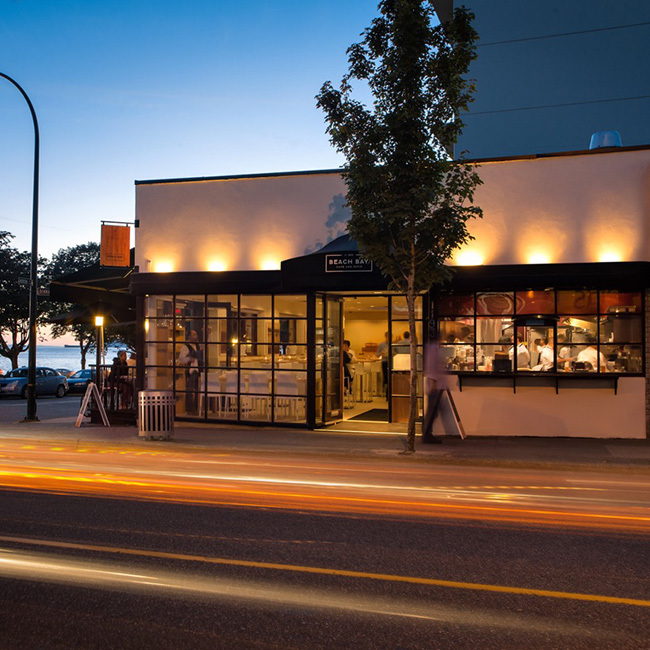 While the West End’s Beach Bay Café & Patio may be known for its delightful beachside digs, the Denman street restaurant is also home to a little road-side walk-up window. Although the menu offered from the window changes daily, those who stop by can expect great snacks and delicious lunch items, ranging from $5 to $12 in price. 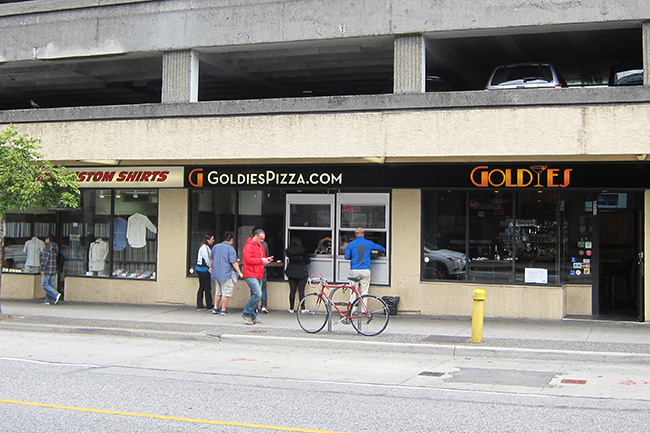 In addition to a dine-in restaurant area and bar, Goldies Pizza, on West Pender, also features a pizza by the slice walk-up window, perfect for downtown dwellers and workers who want to grab a slice on-the-go. 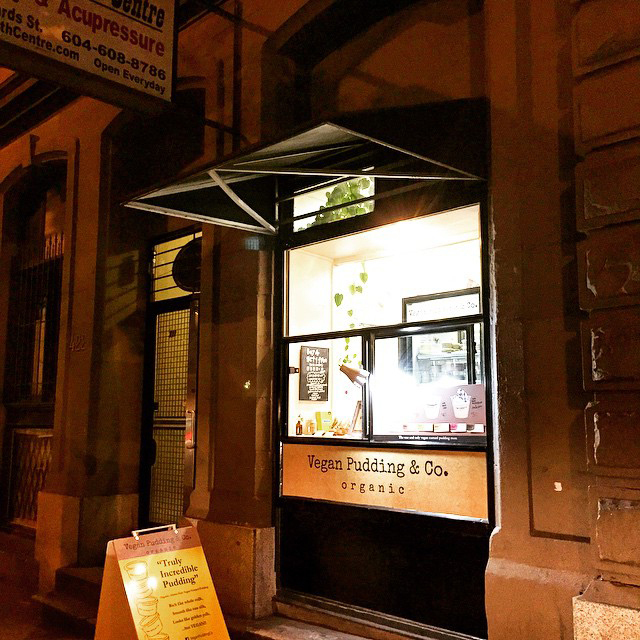 Guilt-free, hand-made dessert is what you can expect to find at Vegan Pudding Co.’s little walk-up window. Priding itself on being the one and only vegan custard pudding store in Vancouver, Vegan Pudding Co. offers customers creamy cups of vegan, organic custard (great for those with allergies and food intolerances), which come in variety of flavours including vanilla, chocolate, strawberry, matcha green tea and black sesame. 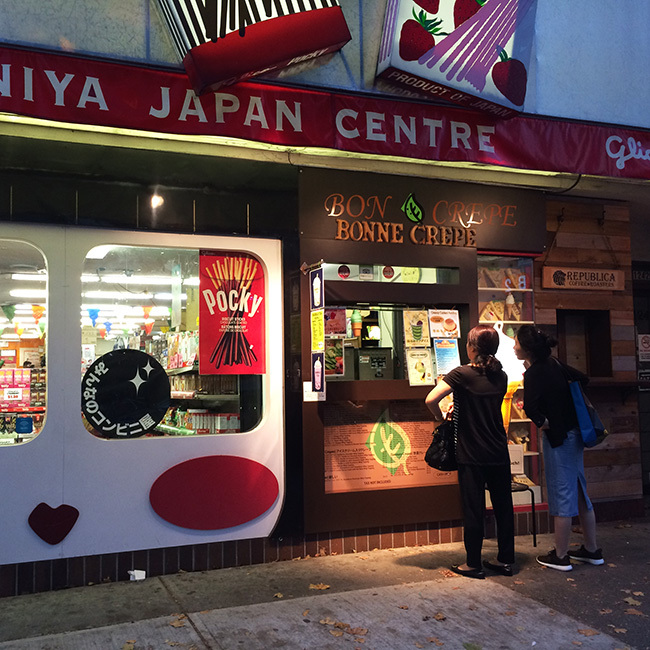 Located between Bute and Jervis, this petite takeout window attached to the Japanese grocery store on Robson is pretty easy to miss. Open Wednesday through to Monday, from 1 p.m. onwards, Bon Crepe offers a varied selection of sweet and savoury Japanese-style crepes. In addition to the original tasting crepes, Bon Crepe also offers a variety of parfaits and puddings. JJ Bean’s CBC Plaza branch is home to a sizable walk-up window. 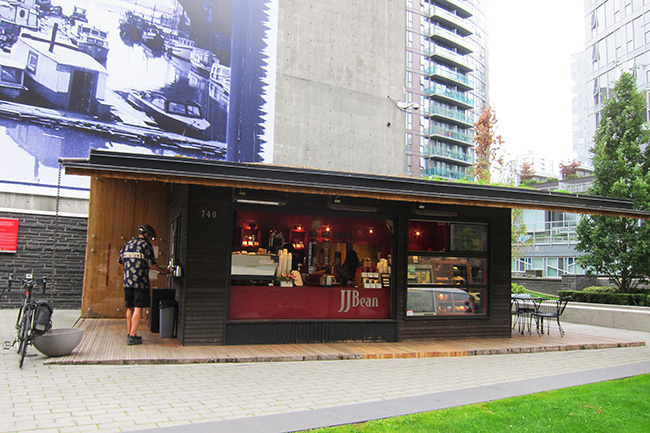 In fact, the whole front facade of the JJ Bean cabin is pretty much a walk-up window. Despite looking roomy from the outside, there is actually nowhere to sit down, thus this JJ Bean location operates more as a take-away coffee shop.